MRO TOOLS Extra Long Grip Wing-Nut Cleco Fasteners (KWNEL) are hand operated clamps with a wide range of grip force and are best suited for low-production settings where additional tools such as pliers, wrenches, and ratchets are not required. MRO TOOLS Extra Long Grip Wing-Nut Cleco Fasteners are designed with a free-wheeling wing-nut that is easy to grip and will back completely off while still remaining intact with the body. MRO TOOLS Extra Long Grip Wing-Nut Cleco Fasteners feature a clamping force of 12-300 lbs that makes them suitable for all types of metallic and composite materials. MRO TOOLS Extra Long Grip Wing-Nut Cleco Fasteners are widely used in automotive, racing, and aircraft sheet metal repair. MRO TOOLS Extra Long Grip Wing-Nut Cleco Fasteners are designed to temporarily fasten multiple sheets of material together before the pieces are permanently joined. MRO TOOLS Extra Long Grip Wing-Nut Cleco Fasteners are a simple and inexpensive alternative to competitive fasteners and are available in various lengths and strengths to accommodate different processes. The MRO TOOLS KWNEL-FW1/4 Extra Long Grip Wing-Nut Cleco Fasteners is one of thousands of quality tooling products available from MRO Tools. Please browse Extra Long (KWNEL) 1/2''-1 1/2'' Grip Wing-Nut Cleco Fasteners for tools similar to the MRO TOOLS KWNEL-FW1/4 Extra Long Grip Wing-Nut Cleco Fasteners. MRO TOOLS KWNEL-FW1/4 Extra Long Grip Wing-Nut Cleco Fasteners description summary: MRO TOOLS Extra Long (KWNEL) 1/2''-1 1/2'' Grip Wing-Nut Cleco Fasteners. 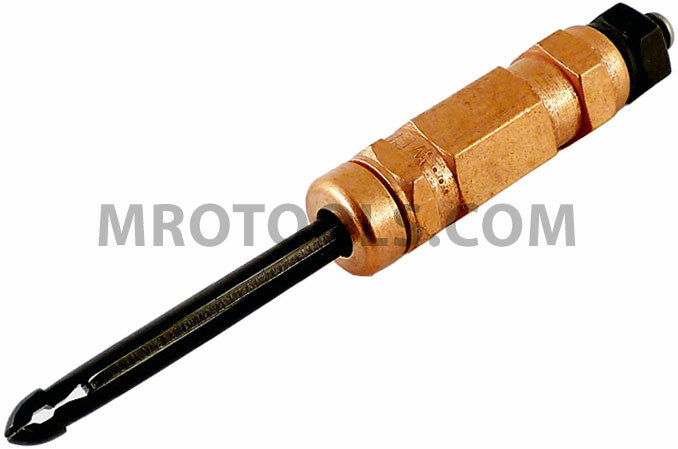 Color: Copper Diameter: 1/4'' Drill Size: 1/4'' Grip Range: 1/2''-1 1/2'' Quantity discounts may be available for the MRO TOOLS KWNEL-FW1/4 Extra Long Grip Wing-Nut Cleco Fasteners. Please contact MRO Tools for details.